As a manager, you know that in today’s competitive marketplace your team’s customer service is often your greatest differentiator. The challenge is ensuring that everyone gets consistent training on how to deliver one-of-a-kind service, where price becomes less relevant. Initiate positive first impressions. How, in the first 10 seconds, employees may inadvertently offend customers. How being ‘polite’ can be interpreted by customers as rude. 4 keys to making small-talk easier with strangers. 6 keys to enhancing your professional image regarding dress, voice, and business etiquette. How to overcome shyness in business and social settings. Build rapport. Conversation starters that put customers at ease. A simple tip to ensure that a compliment isn’t perceived as phony flattery. How to bridge the gap when there are cultural communication differences. Create trust. How to consistently meet and exceed your customers’ expectations. Building your personal and professional reputation. When admitting ignorance canenhance your credibility. 6 commonly used phrases that inadvertently diminish trust. Tune-up telephone manners. Creating a competitive advantage in the first 5 seconds of communication with customers. How to answer calls with greater clarity, warmth, and efficiency. How to convey a more positive telephone image – even when you’re not having a great day. How to put a caller on ‘hold’ without putting them-off. Telephone etiquette: How to juggle a phone call and a person standing in front of you. Help customers buy. Having the right-mind set for selling your products, services or ideas. Choosing two words, that when used more frequently, enhance perception by 12% (hint: it isn’t please or thank you). 7 steps to make a successful ‘cold-call’ to someone you’ve never met. How to be persuasive without being pushy. Eliciting others’ needs without peppering them with questions. The most significant, frequently overlooked step when listening. When to surrender control during a buying conversation. How to create an emotional bond that moves others to action. A six word phrase that enhances the perceived value of what you’re offering. How to ask for the order without sounding pushy or patronizing. Addressing objections with diplomacy. Why ‘up-selling’ is so profitable and often so poorly done. How to position an up-sell as a value added service. How to use the ‘humility advantage’ to increase referrals. Recover trust when things go wrong. Discover the most frequent cause for customer complaint – and how to prevent it before it occurs. 4 ways to break bad news – without generating hard feelings. Differentiating between customers who are upset – and those who are abusive, and what to do about each type. How to convert an upset person into an advocate of your services using the T.E.M.P.E.R. ; © approach. The one common question to not ask when gathering background information about a customer concern. How to express empathy without sounding patronizing. How to handle a complaint when you weren’t the cause of the problem. Seven 45 minute audio CDs presented by Jeff Mowatt in an engaging, entertaining (so they’ll want to listen) interview style. Learning Guide to enhance comprehension and retention. Manager’s Guide to tailor the strategies to your organization’s unique circumstances. Comprehension Test reveals how much has been retained from the training and identifies areas that need to be reviewed. Graduation Certificate assists in recording and recognizing each individual’s completion of the program. The Bonus – only available with this training system! This system also includes a CDrom featuring all the written support materials. The ability to print the documents as needed means that one kit contains all the materials to train any number of current and future employees. Heavens, we teach customer service, we certainly want you to be happy as our customer! If you’re not completely satisfied with this or any of our training resources, just return it within 30 days for a full refund. These tools get results! 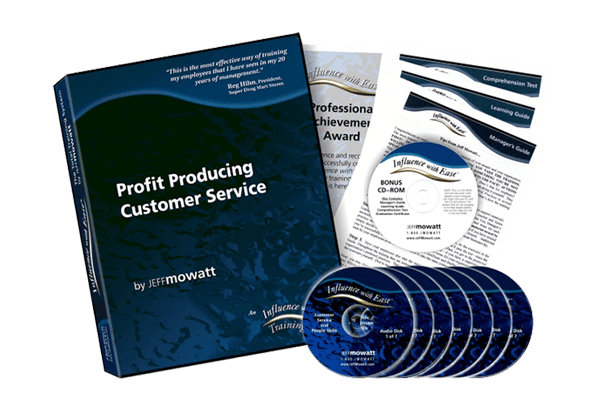 Working with Jeff Mowatt’s Profit Producing Customer Service training kit has allowed my team to increase their retail sales by 80% over a one year period. We’ve also used Jeff’s other training tools and found that they have made a major difference in my business; our behaviour & communication towards each other & towards clients has significantly improved. Jeff, just a short note to tell you how much we appreciated listening to your “Profit Producing Customer Service” self study kit. Our staff listened to all the CDs at our regular staff meetings. They stimulated discussion and made us think of new ways to satisfy patients and meet their needs. As owner/managers we especially like the comprehension test. It gave us a way of measuring our staff’s comprehension. We have even used it to screen prospective employees. This is a one time investment in your people that will pay for itself over and over. 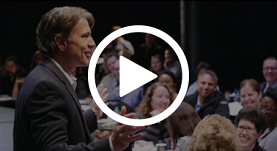 This is the best front line training program I’ve seen – by far! The most creative and innovative approach to customer service I’ve seen yet. If you care about the success of your business you will do two things: 1.Listen to these techniques. 2. Do them! This is the most cost effective way to teach customer retention skills to front line employees I’ve seen. This is the kind of training we’ve been looking for. It gets you involved, allows you to measure the results and does so very economically. This is an effective system that can produce big returns on a small investment. This is the definitive tool in achieving a competitive advantage.